This should be called the Lakeland Center Revival! Why? 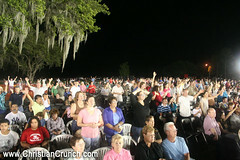 Because for the next 14 days the Florida Revival and Healing Outpouring will be rooted at the Lakeland Center again. But with being in the same location for a period of time the presence should be intense. Many of the major ministers over the last few decades are visiting. Here, Randy Clark and his daughter came out to visit with Todd Bentley and Fresh Fire ministries, as well as to bless it. He mentioned how similar both moves were, and how uniquely God is moving. They, like many others, just come to soak in the presence. The Lord is also manifesting mighty miracles in many individuals lives in the areas. I have had two friends starting to flow in prophetic dreams again. I myself have seen more divine appointments in the last 2 weeks than in the entire last 2 years. God is up to something! If you can, come on down to Lakeland, Florida. Visit us at the Lakeland Center, or at Lakeland Linder Airport, or wherever you can. Come and soak in the worship of Roy Fields. 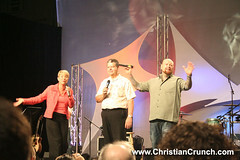 Come and listen to the powerful words of faith from Todd Bentley. Come and network with the brothers and sisters who have come for a touch from the Holy Spirit. This is a powerful time!